I finished reading this book, sitting up in bed. I clapped it shut and burst out “Bloody brilliant!”. Now I love my history books as much as anyone, but I don’t always react with such enthusiasm. The book came with high credentials- the string of medals across its front cover indicated that it was going to be pretty special ( winner of the NSW Premiers Literary Award 1996, the National Book Council’s Club Banjo Shortlist 1996, the winner of the Premier’s Literary award- not sure which state- 1996, and the Eureka Science Book Prize 1996.) I wasn’t disappointed one little bit. The book’s full title is “Hunters and Collectors: The Antiquarian Imagination in Australia”. Griffiths describes the antiquarian imagination as “a historical sensibility particularly attuned to the material evidence of the past and possessing a powerful sense of place”. (p1). His book explores the tensions between two groups of people in relation to history: Aboriginal and non-Aboriginal Australians, and amateurs and professionals. He explores these tensions by focussing on a handful of 19th and early 20th century Victorian (as in the state of Victoria) antiquarians and collectors. For example – R. E. Johns collected a huge number of Aboriginal skulls and his drawing-room collection ended up at the Beechworth museum. Alfred Kenyon was a collector of stone artefacts and involved in societies like the Anthropological Society, the Prehistoric Club, and was heavily involved in Port Phillip history. For the family historians among you, you’ll know that the Kenyon index in at the State Library is a well-thumbed card index of the pastoral pioneers of the district. Then there were the nature writers of the early 20th century like Donald McDonald who wrote nostalgia-based nature columns like “Village and Farm” or “Nature Notes and Queries” for the Argus, or Charles Barrett who wrote for New Idea and the Victorian Naturalist. We might feel uneasy about gentlemen amassing aboriginal skulls and artefacts for their drawing-room collections, but Griffiths points out that as well as the acquisitive aspect of their activities, there was a political and intellectual strand as well. Although they were not academics – indeed many were hostile and suspicious towards academia as a whole- they did correspond with other collectors internationally and were particularly interested in the classifying aspect of anthropology. For the collectors based in Victoria, there was a tension between their interest in “real” Aborigines, preferably far distant in central Australia, and their eagerness to distance themselves from urban and what they would see as “half-caste” Aboriginal political activism in the present. For example, Barrett and Kenyon’s book Blackfellows of Australia, written in or around 1936 in available online here. It’s well worth a look, and sobering to consider that it’s being written at about the time of the Aborigines Advancement League, William Cooper and the Day of Mourning. Then there’s the issue of amateur and professional historians, and the tension between memory and history. This was of real interest to me, because as I may have mentioned, I am fairly heavily involved with my local historical society. It was established in 1967, just in advance of the flood of historical societies that commenced between 1970 and 1990. Local historical societies are grounded in a powerful sense of place and at first tend to revolve around key people and a “keep it under the bed” mentality. This section of the book was particularly pertinent to me, as Kenyon lived in Heidelberg with his daughter, and I’ve caught several references to him in our collections. There has always been, as Griffiths points out, an uneasy relationship between universities and local historians, and I confess to feeling that tension from time to time, overlaid as it now is by friendships and local loyalties. And as Griffiths also points out, universities too have increasingly been repackaging their course offerings into “public history” as a more saleable income stream in the face of decreasing funding. I hadn’t particularly considered before the proliferation of history and nature societies and mentalities that still lingered in the 1960s education system that I grew up in. For example, many of the antiquarians he writes of were involved in the different commemorative days that school children were involved in (Wattle Day, Arbor Day etc) and groups like the Gould League of Bird Lovers. In particular, there was a link with the School Paper that all Victorian school children received regularly as a supplement to their School Reader. There’s copies of the April 1911 School Paper devoted to Australian History on the SLV site here– again, well worth looking at- for its emphases in telling Australian History. Griffiths brings the antiquarian imagination right up to the present day with his description of “history towns” like Maldon in Victoria, and planning and demolition battles over what bureaucrats vs. locals might regard as significant buildings. He writes of the modern wilderness movement and the contradictions of attempting to maintain a “pristine” environment which is nothing of the sort. He closes his book with a personal reflection of his own role as a collector for the Museum of Victoria, and how it intersected with the activities of the earlier antiquarian collectors he describes in this book. In this epilogue you can detect the influence of the historian Greg Dening in particular, whom he names almost first up in his acknowledgements. The epilogue really is masterful: it returns our gaze to the men and their intentions on which the book is based, and reminds us how they have been interwoven into our own history-making today. And, in case you haven’t picked it up, this really is a bloody brilliant book. Oh dear, oh dear. I don’t know if I understood this book. History is everywhere. It seeps into the soil, the sub-soil. Like rain, or hail, or snow, or blood. A house remembers. An outhouse remembers. A people ruminate. The tale differs with the teller. From these opening words, this seems like a book I’d really enjoy. It is set in the Irish countryside- 1970s maybe? 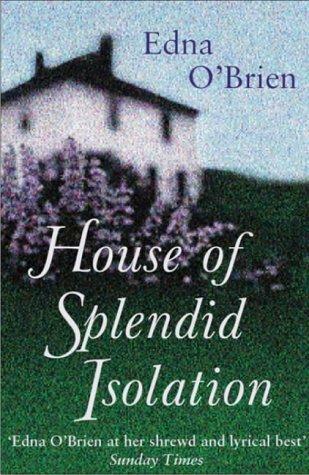 – where an elderly widow Josie O’Meara lives alone in her increasingly decrepit old house. Her solitude is invaded by McGreevy, an IRA gunman on the run, who hides there. I suppose that you could say he has taken her hostage, but it doesn’t feel that way as they co-exist in the house and eventually draw closer to each other. The book is told with sharp, cut-away snippets told from multiple perspectives. The narrative slows down when Josie recalls her unhappy marriage to one of two brothers, who brings her to live in the family home. It is a violent marriage that drags itself along in unhappiness. Her life is brightened by the arrival of a handsome young priest, but he leaves. When McGreevy arrives, it’s as if she has been enlivened again by his masculinity, which is wound up into her delusion and confusion. A book about the IRA is political by its nature, but Josie is not an IRA sympathizer. It is more that she, and the other villagers around her, are tired of the killing. Indeed, it is the Garda, lying in wait for McGreevy who seem the more brutal. But all of this is gleaned in snatches, and the reader has to work very hard to string together the narrative in this book. Rather too hard, I think. I closed the book with a “What?? ?” at the end, completely bewildered by the last pages. I still am none the wiser. I was speaking to a fellow postgrad of close proximity (wave!) the other day and he commented on the deluge of research amongst our postgraduate colleagues in Aboriginal history now, compared with the 1970s, when he first dipped his toes into the historical waters. It brought home to me the distinctiveness of Reece’s Aborigines and Colonists, published in 1974, where it joined a handful of books written after Stanner’s Boyer 1968 lectures that spoke of “the great Australian silence”. There was John Mulvaney’s work, and C.D. Rowley’s trilogy, and Henry Reynolds had published a book of sources and some journal articles- but not yet the books that he was later to become famous for. In fact, it’s difficult to read Reece now without peering through the dust raised by Reynolds, Windschuttle etc. in the history wars of late last century. There was such a heightened moral fervour in that debate that Reece’s work seems very cool and dispassionate in comparison. The aim of his book, he says in the introduction, is to examine the “Aboriginal problem” as seen by philanthropists, squatters and colonial administrators, and so it locates itself very clearly on “one side of the frontier” as Reynolds might have characterized it. The early chapters of the book explore the mindset of “improvers” and “officials”. Among the “improvers” he identifies those who wanted aborigines separated from white society as distinct from those who opposed segregation; those who thought that the introduction of Christianity was the main priority; those who saw “kindness” as a sign of weakness, and those who were repulsed by the sight, the smell and the sensational anecdotes that surrounded the Aborigines. He traces through the changing emphases of official policy and the influence of evangelicals on Colonial Office policy, particularly in the mid 1830s, and the changes during Gipps’ tenure up until about 1844. 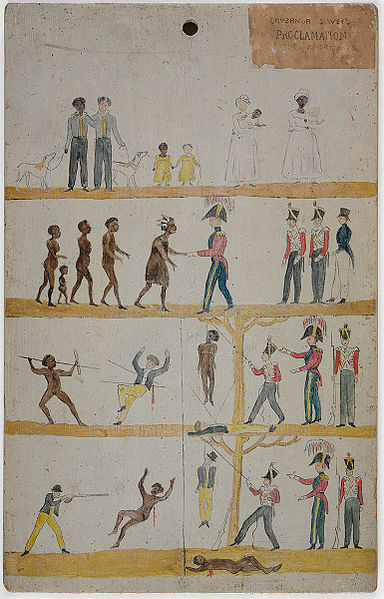 He sees the brief period between 1838 and 1844 as the time of genuine, but ill-informed attempts to bring Aboriginal and white relations under the framework of the law and to improve the spiritual and material welfare of Aboriginal people. He focusses closely on the Myall Creek Massacre of 1838 which he contextualizes as one of a series of massacres in the Liverpool Plains district at the time. It is here that I most clearly noticed the sober tone of his writing. He does not underplay the death and cruelty of Myall Creek but nor does he sensationalize it, and the writing is more powerful for it. He also injects field research (quite literally) when he writes of Len Payne and Cecil Wall traipsing around what had been the Myall Creek stockyard, digging up hinges and fence posts. Cecil Wall had been the last of a succession of Walls who had worked on Myall Creek. You can read more about this here, in a rather idiosyncratic site. Reece also spends quite a bit of time on the Port Phillip district, which was being newly settled at the time of the Myall Creek massacre. It was in Port Phillip that the evangelical vision of Aboriginal Protectors was trialled, and found wanting. He is particularly critical of La Trobe over his unfavourable reports of the Protectorate which made no recommendations to Gipps and provided little insight into the problems they faced. I’d take issue with this: I see La Trobe as a benign but ultimately impotent figure in relation to the Protectorate. Within the tenor of the deferential relationship he had with Gipps, I don’t think he could be anything else. Nearly forty years after publication, this book still stands strong but it was a product of its time. It would be wrong to chide it for the perspectives it does not explore- aboriginal resistance, aboriginal agency- because these historiographic themes did not emerge until decades later, and no doubt will be themselves overtaken. As a trailblazer in its field, this book might well have been drowned out by the flood of later research, but its dispassionate tone serves it well. Could I really be so humourless that it’s taken me until the end of May to find something to make me laugh? 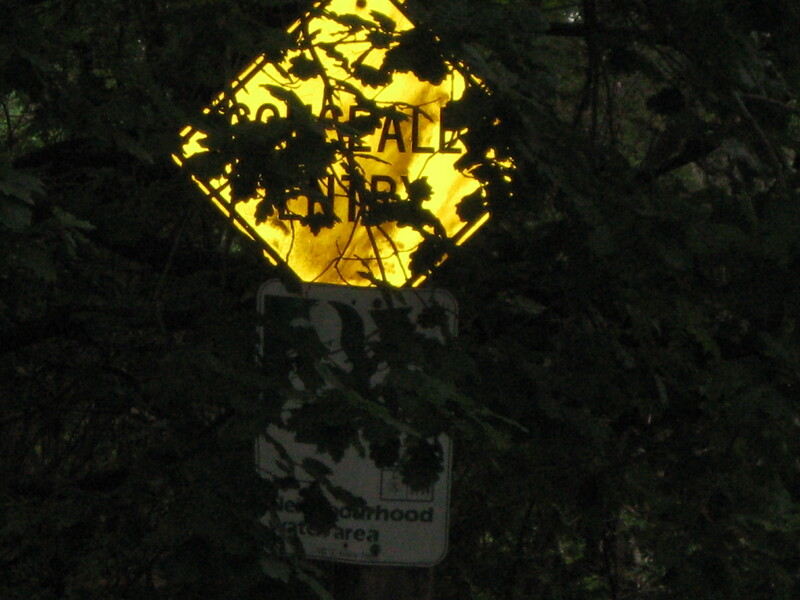 Actually, I saw this back in March. The entry wasn’t the only thing concealed. And not much “watching” going on here, I suspect. You’ll be pleased to know that the tree has since been pruned. So what IS a lovesong, after all? It’s a performance, a creation with words and music, written sometimes for a particular person, or sometimes as a fantasy on the experience of being in love. Alex Miller’s book is called “Lovesong” and I think it falls into this final category. It could just as easily have been called “Love Story” – although I think that someone already has used THAT title! – because it’s a love story in its own right, but it’s also a story about love stories. We all have our own story about love, but we can’t all turn them into lovesongs. The frame story has an aging writer, not unlike Miller himself, who has returned to Carlton in Melbourne after an extended stay in Venice. Like Miller, whose last book “Landscape of Farewell” was well received, the author Ken’s last book was called “Farewell” and he expected that it would be his final book too. But he finds himself at a loose end, and the writer in him begins observing the owners of the pastry shop that has opened up in his small Carlton strip shopping centre. The wife is Tunisian and exotic, the husband Australian. He watches and gradually strikes up an acquaintance, then friendship, with the husband who tells him his story. The story of Sahiba and John is the love song of the book. They met in Paris where she lived and worked in her aunt’s restaurant and after the aunt’s death they worked there together. Like all love stories, it was complicated by other desires- for home, for a child- promises and secrets. I read this book along with others in an online reading group, and several of us had a similar response at much the same place in Sahiba and John’s story – “hold on- how does he know all this?” I’m still not sure whether this is a failing or sheer artistry on Miller’s part. Instead of the love story, which is tender and sad and real, you become aware of the telling of the story itself. While Ken is drawing out and shaping John’s story, there’s his own domestic life in Carlton with his daughter who turned up after her marriage broke down five years ago, and has just continued living with him. She has recently started a relationship with a stand-up comedian who embodies the footy-loving, commercialized parochialism of suburban Melbourne. Where the love story of Sahiba and John is burnished and somehow sacred, his daughter’s relationship seems banal and shallow. I’m always pleasantly surprised by Miller’s books. I come to them with an expectation that they’re going to be difficult- probably because in interviews he comes over as a fearsome intelligence himself- and each time he cuts through my trepidation with simple, clean prose that captures a setting or a feeling with a ‘click’, like a lens. Miller makes many references to Aschenbach in ‘Death in Venice’, and certainly Ken is an aging, world-weary narrator. I feel as if he’s offering this book to us, as a lovesong to love itself. 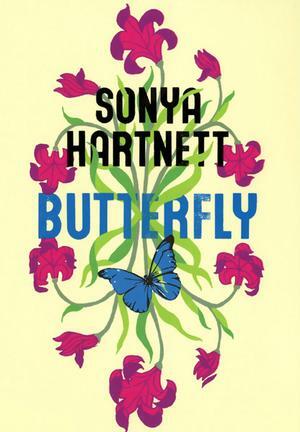 I don’t think I want to live in Sonya Hartnett’s worlds. They’re brutal places where damaged children are lacerated by cruelty and neglect, and where as a reader you start to feel as if you have no skin. This is the third Hartnett I have read and I feel as if I am reading the same book over and over. I’m starting to wonder if there’s something rather unhealthy about her work. This has been shortlisted for the Miles Franklin and as my annual torment, I try to read the shortlist before the winner is announced. I doubt if I’ll succeed this year, but I’ll give it my best shot. This is not the first time Hartnett has been shortlisted for major awards- she was shortlisted for the Miles Franklin for ‘Of a Boy’ in 2003 which at the time I wondered about, and was shortlisted for the Age Book of the Year for ‘Surrender’ in 2005, and at the time I thought that she had a real chance of winning. And now ‘Butterfly’. Again I find myself raising a quizzical eyebrow and wondering “Mmm- Miles Franklin?”. The book started off badly for me because I loathe books that start off with a character regarding themselves in the mirror then proceeding to describe everything they see. In my list of writing sins this comes pretty close to the top, followed closely by describing food and Hartnett does quite a bit of that too. I’m as entranced by the “lyrical” novel as much as the next reader but her images and metaphors just sit on the page, indigestible and distracting. Even the name annoys me: “Plum”. I felt very much as if I was reading a Donna Parker book from my early adolescence and despite the frequent references to the heat, I felt as if it was set in 1960s America- perhaps it was the double storey house that did it? It’s written in the present tense which is another narrative technique that makes me fidget. For probably 2/3 of the book I was very close to giving up on it- and that’s from someone who rarely fails to finish a book. I kept reading and finally, in the last part of the book it did click, after all. But I’m not convinced that a book shortlisted for the Miles Franklin should take 130 pages to engage its reader. I’m no longer an adolescent girl of course, and thank God. Yes, I know that friendship is hard, and that hanging round with a large-ish group of girls as I did in high school had its own perils and insecurities. It hurts to think back, and I’m pricked by my own embarrassment and shamed by times when I behaved just as badly to others. Would it have helped to read about it at the time? I don’t know. Do I want to read about it now? No. Look at what you can buy at Aldi this week. So, if you’re heading down to Cronulla or feel like a bit of Commonwealth rivalry, with the handy sleeve feature there’s no need to clutch the flag around you to stop it falling off. Both your hands are now unencumbered so let the flag fly free! Actually, have I told you yet that I own the flag? Well, not me- my family. And not really. In a book called Flag and Nation, Elizabeth Kwan writes about the 1901 Commonwealth government competition to design the flag. The judges chose a similar design submitted separately by five entrants: Annie Dorrington from Perth, Ivor Evans and Egbert Nuttall of Melbourne, Leslie Hawkins of Sydney and William Stevens of Auckland. So that was the real flag. But there were complaints that the Commonwealth star was too big in the winning design, and besides, William Lumley of Melbourne had submitted another design (that looks pretty much the same to me) that foreshadowed the white ensign that would be chosen by the Royal Australian navy 60 years later. And that William Lumley is my great-grandfather!!! Lampard? Who’s Lampard? Is my great-grandfather (gulp!) a plagiarist or appropriator? Should an aspiring historian confess to such a forebear? I must admit that ‘business broker’ makes sense as the family has spawned several entrepreneurs and businessmen- a gene that skipped over me, I’m afraid. And to be fair, there was absolutely no family lore at all about the flag design which one might have expected had there been an overlooked flag-designer in the family. When Elizabeth Kwan contacted the family about it, it was certainly news to us. But, never one to let the facts stand in the way of a good story (and an aspiring historian certainly shouldn’t confess to that!) as the great grand-daughter of the man who probably submitted the designs on another’s behalf, I think I’m close enough to owning the flag. The 1902 Test Cricket match seals it. Therefore, I think that I’m entitled to a cut of the – let’s see…- $4.99 purchase price. I’ll let you know how I spend the millions in royalties.